Introduction: Packed food can be considered as a source of contamination due to the migration of plasticizers or monomer from packaging to food. In fact, the contamination usually regards the contact with plastic containers or films that are made in a different way. This chemical migration can be considered as diffusion, in particular it was time and temperature depending. These compounds that can migrate into food are usually investigated for their toxicological aspects. Objective: This review is aimed to describe the reasons for which food are usually a main source of adipates, phthalates, alkylphenols, 2,2-bis(4-hydroxiphenyl)propane for human. In fact, international interest for the monitoring of these chemicals into food and so the human exposure is an important topic. 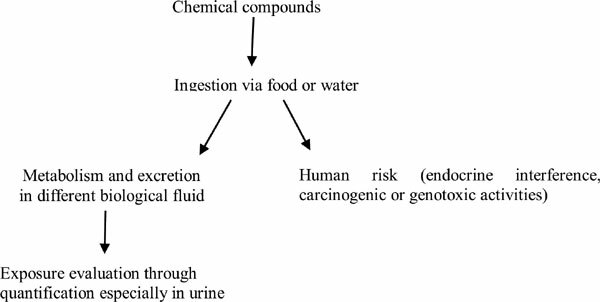 Methods: Many studies were carried out to monitor the presence of the above cited compounds in different food also considering their toxicological profiles and to find a reason for their presence. So, many of these researches were described with regard to the presence of these compounds and the consequent human exposure. Results: The migration of these compounds into food was fully investigated in studies that employed food or food simulants as suggested by European Union (EU). In particular fatty or packed foods are observed to have higher levels of them. Toxicological studies were conducted and a lot of information for each compound was found. The use of BPA-Free packaging is not considered as safe because BPA is replaced by other bisphenols with same structural characteristic. Conclusion: Actually EU established migration limits relating to packaging and European Food Safety Authority (EFSA) continuously proposed TDIs or limiting uses of some plasticizers or monomer after acquisition of data from different countries. For this reason plastic packaging are changed, even if the use of analogues chemicals employed, such as for BPA, can be better investigated. In fact these compounds present in BPA-Free products are not always regulated and data related to them is unavailable. Plasticizers, bisphenol, packed food, human health, migration tests, endocrine disruptors.